We didn’t check our bees on Sunday as we were too tired, so Monday evening about 7pm we went to have a look at them. There were a lot of bees and all the sugar water had gone. We checked the bottom board and it looked like this – not sure if this is normal or abnormal – need to check. 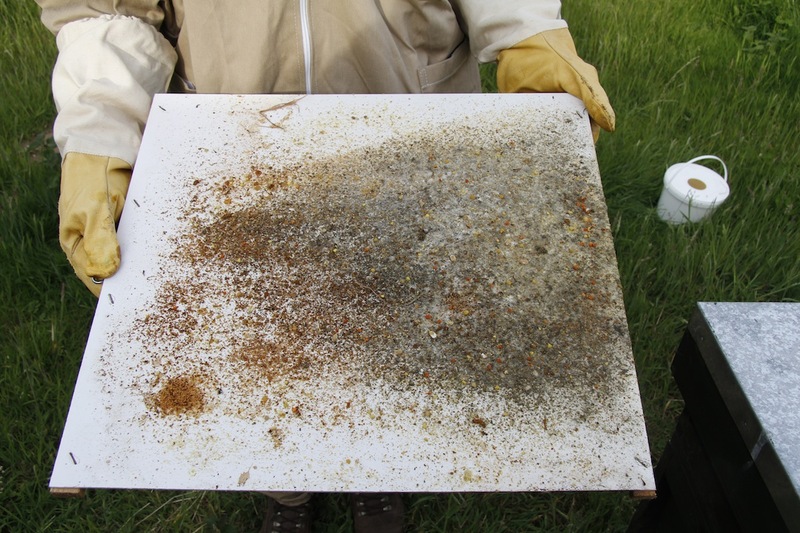 In the outer new frames there was pollen, capped honey, capped brood and lots of bees. In the inner, older frames there was lots of empty cells in the middle of the frame and lots of bees. There were lots of bees everywhere. 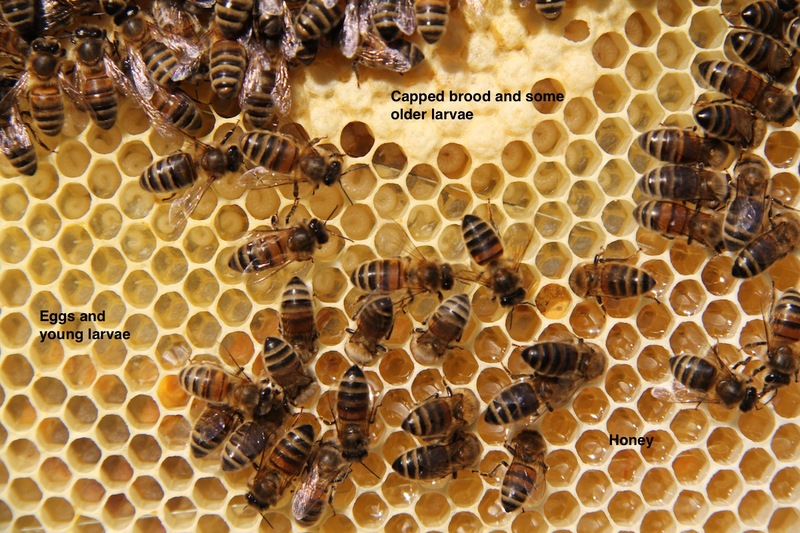 There were not many eggs or unsealed brood. We saw the Queen – always a relief. We also found more Queen cups; we found Queen cells with larvae in them; and we found a sealed Queen cell. From my limited reading it looked as if our new little hive was getting ready to swarm, but we weren’t ready to deal with a swarm. 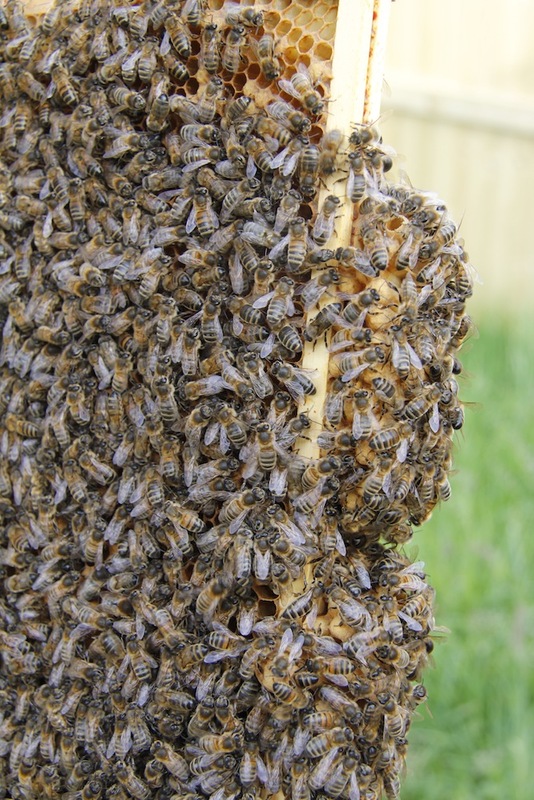 We rang up Brian from our local bee club for advice and he told us the hive was about to swarm and we would have to do an artificial swarm. We were not ready for this. We have only just got used to doing our weekly checks. 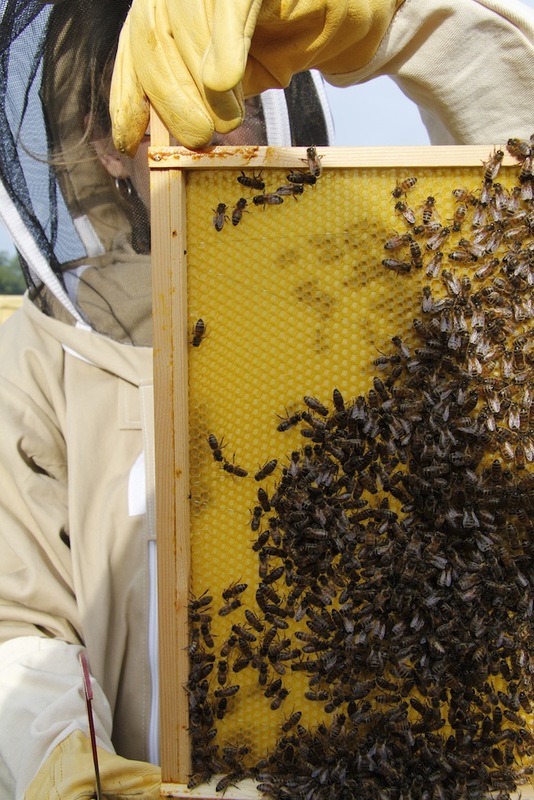 We had a spare hive, but not a full complement of frames with foundation. I was meant to buy some last week at the bee club, but I couldn’t find the bee club. There was nothing else to do, I had to steel myself, grab my Haynes Bee Manual (I know – how cool is that?) and undertake an artificial swarm. Back on went the bee suits and we set off for the apiary. 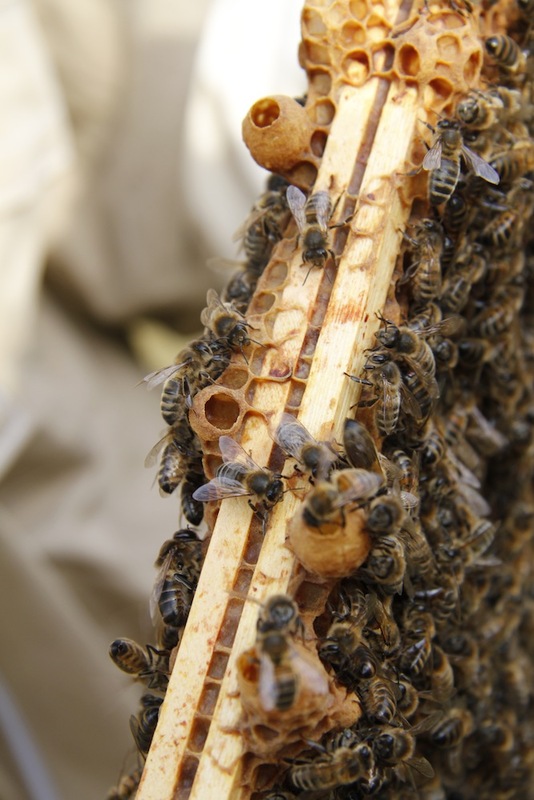 Once there we got everything prepared – we moved the old hive to a new location about 2 metres away and at a 90 degree angle and placed the new one on the old site. I then began to look for the Queen. I check every frame – no Queen. I checked every frame again – no Queen. I checked them again and again – no Queen. Where was she? 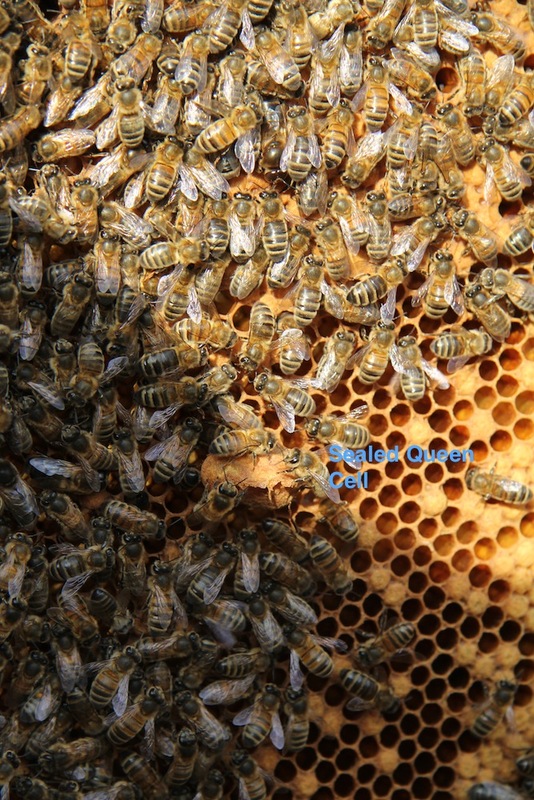 We checked on the super and the hive lid, we checked everywhere. 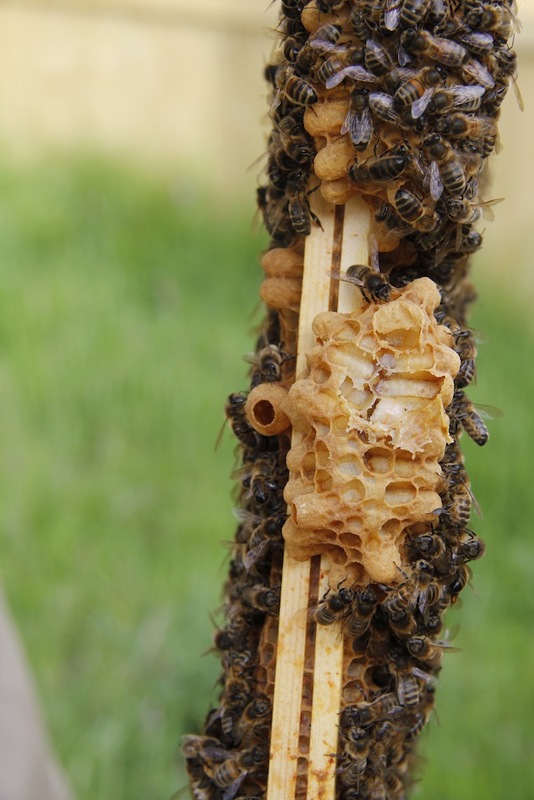 I had resigned myself to having to get up at 4am and do the artificial swarm then, before heading off to London, when I checked the first frame again, the frame I take out first and check and then rest on the lid of the hive, the frame that didn’t have many bees on. And there she was, our lovely little Queen. I grabbed the frame and put it in the new hive. We got a frame of brood and added that along with a rather empty frame that the bees had begun to build out from the foundation. We shared our meager 17 frames between the two hives, put sugar water on top and shut everything up. It was now 9.30pm and it had taken us about two and a half hours and we still hadn’t had our dinner! 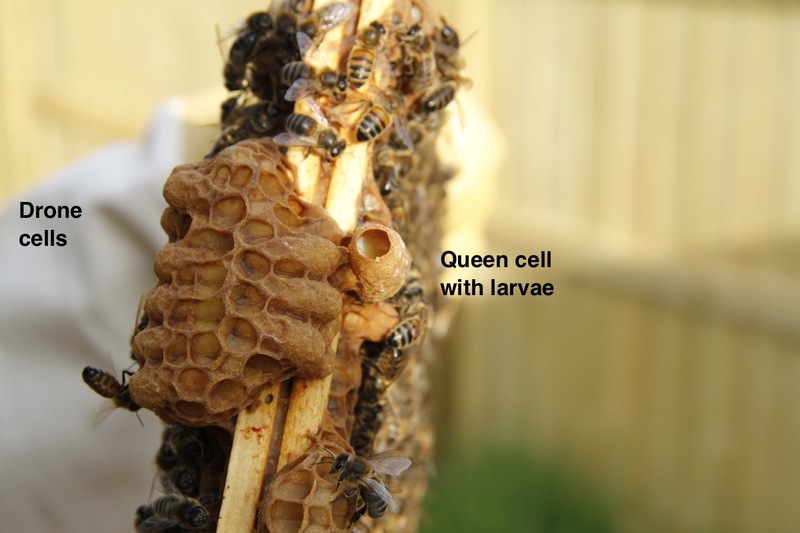 For me this was a successful undertaking: I had identified a sealed Queen cell, we had taken advice and followed the instructions in the book for undertaking an artificial swarm – whatever happens, I have learnt a lot. 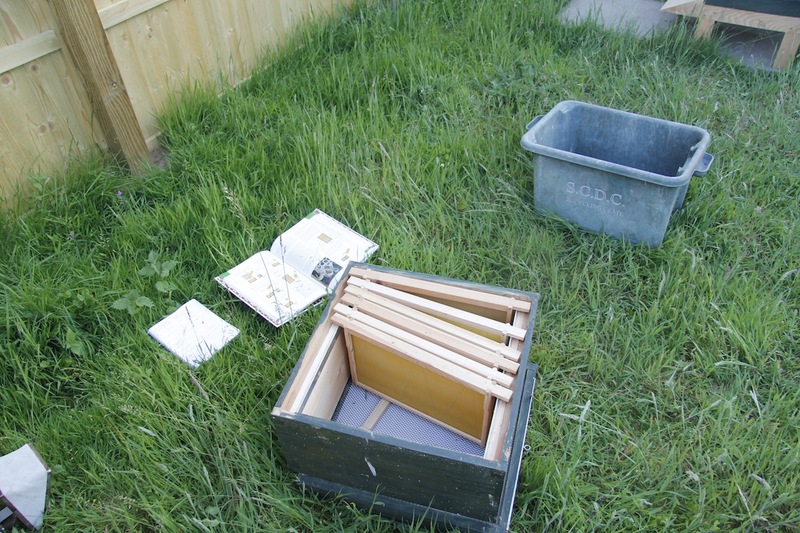 Today I will try adn locate bee club and then check the hives again either this evening or tomorrow and see if everything is OK – I really hope so. oh my god another edge of my seat tale. You are hero and shero to me. Great job, especially missing your dinner, and sticking to your task finding that sneaky queen and making a new hive (applause, applause).